Summary: A potentially fun crossover is too little substance and too much of a stalling tactic for the real meat of the story. Barry is surprised when Felicity Smoak arrives from Starling City along with her boyfriend, Ray Palmer, who flies in as the Atom. They’ve come to visit S.T.A.R. Labs so Ray can get help with the power supply in his suit. Their timing turns out to be fortuitous because it’s all hands on deck after a meta human named Brie Larvin,, aka the Bug-Eyed Bandit unleashes hundreds of robotic bees to attack and kill her former co-workers, including Dr. Tina McGee. When Barry nearly dies from a bee attack, the team realizes that Ray must uses his Atom suit to help take Larvin down. They work together, and manage to defeat her. Meanwhile, Eddie struggles with knowing Barry’s secret, causing problems in his relationship with Iris. 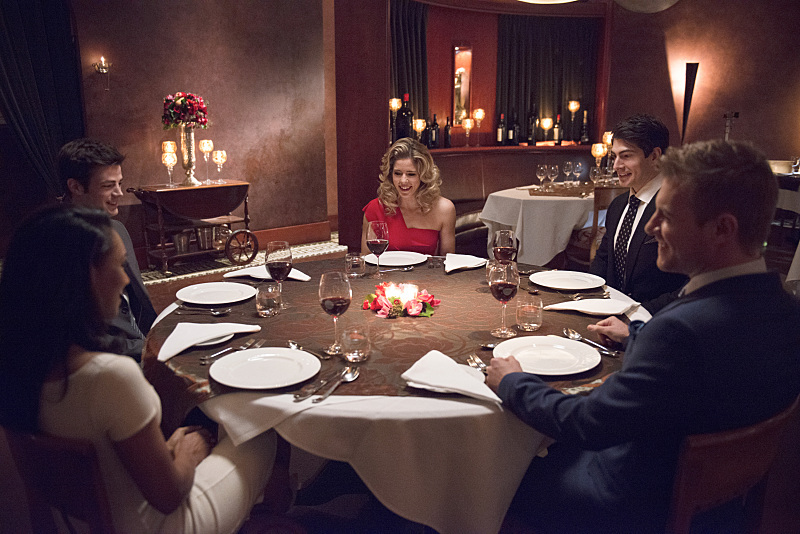 A group dinner with Barry, Felicity, Ray, Iris and Eddie turns into a disaster, as Iris has a big blow-out with Eddie for keeping secrets. Barry tries to convince Iris that Eddie is keeping her in the dark to protect her from darker police stuff, but she doesn’t totally buy it, and wants the full truth from Eddie. Barry struggles with trusting Caitlin and Cisco, wondering if they are in on the Wells conspiracy, but Felicity convinces him that they are his friends and he should tell them the truth. 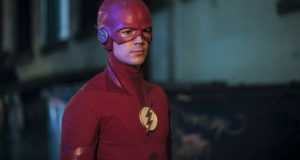 Barry fully reveals his theories to Caitlin and Cisco, and Cisco reveals he has been having flashes of the alternate timeline where Wells killed him. A key to a good crossover is to either give the the guest characters something vitally important to do, or provide such ample, fanservice-y entertainment during their tenure that it defies narrative logic. 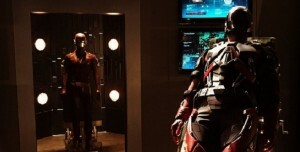 The big and small Arrow crossovers have mostly succeeded in one way or another; Felicity’s position in “Going Rogue” provided a necessary conclusion to Barry’s initial Arrow appearances, while the Arrow’s appearances in the pilot and the midseason crossovers were a giddy passing-of-the-torch and explosively big team-up episodes, respectively. “Flash vs. Arrow” provided some movement in the overarching story for the show, but for the most part, it was a slew of competent comic book fanservice. The only exception is Cisco and Caitlin’s preview performance in “The Man Under the Hood,” which was rather shoe-horned in, but their presence was so unobtrusive (and forgettable) that it didn’t really matter. “All-Star Team Up” tries to be both a team-up episode and a necessary point in the serialized story, but doesn’t quite push hard enough on either account. This is a team-up story where The Flash and The Atom “team-up,” but barely interact in costume, and face a threat that isn’t all that big enough to justify both of them. Meanwhile, Felicity is technically the catalyst for Iris and Eddie’s big blow-up and Barry deciding to fill Cisco and Caitlin in on the truth, but both of those things would have happened on their own without Felicity, or with another character in her place. She’s a good sounding board for Barry, especially given his fear of trust, and Barry’s emotional unloading on her late in the episode is the best scene between them both. But it’s not enough to justify their big trip, which seems to be solely for priming viewers for the upcoming spin-off, in case they haven’t been watching Ray on Arrow lately. That’s absolutely a nitpick, and normally it’s one I’d ignore for the sake of fun. But in this case, it only further muddies the narrative reason Felicity and Ray needed to be in this episode. Whether it was due to scheduling or just a lack of synergy in general, the timing of this crossover just feels ill-advised and forced. It feels even weirder having watched the following Arrow the day after this one, too. If we’re going to eventually be juggling three shows in the same universe, things will become far too convoluted way too quickly if this happens consistently. Emily Kinney doesn’t get very much screentime as the utterly campy Brie Larvin/Bug-Eyed Bandit, though she’s certainly memorable for being the absolute most comic book-y villain this show has done. It’s hard to say if that’s a pro or con, really; Kinney totally delivers on the cheese and clearly enjoys the role, and I can’t deny the pleasure I found in the awful, awful bee/sting/hive puns. A lot like how Wentworth Miller intentionally plays Captain Cold as a unique kind of over-the-top, Larvin is very deliberately being written to sound like some of the more cringeworthy comic book villains, and it’s hard to pinpoint its level of success in a case like that. 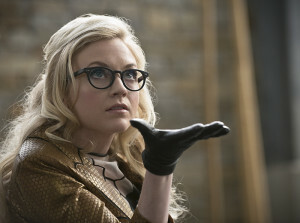 Kinney’s delivery is great, and a cartoonish villain fits this show fairly well. But much like Devon Graye in “Tricksters,” she gets too little screentime to get a true sense of how well she works as a villain. The Felicity-nemesis bit seems unnecessarily shoehorned in — especially when it might have been fun if the two actually were nemeses and got to have geeky puntastic banter. The set for Larvin’s lair and most of the bee effects are all solid, though, and the intricate design of the robotic bees is well-rendered. That said, Grant Gustin has a hard time reacting to the swarm CGI early on; you can tell he’s staring vacantly instead of something specific when he says his lines, which is especially noticeable when the bees swarm into thick patterns right in front of his face. It’s nice to see Larvin’s storyline tied into Tina McGee, though, just to see Amanda Pays back once more. She provides vital insight about Wells for Barry and Joe, too, a nice way to tie these disparate threads into something important. Now, can we get her a scene with John Wesley Shipp, please? Iris is becoming a larger problem, though hopefully this is only a storm to be weathered before she finds a new place in the show. Right now, at least Eddie can function as an audience surrogate to point out just how bad the Iris situation is: “Wow, so everybody but Iris?” he says regarding Barry’s lack of secret identity. He’s got a good point, and plenty of shows, Arrow included, have suffered from the love-interest-secret trope totally bringing the show down. 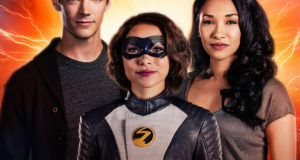 I praised Iris during the first half of the season, particularly Candice Patton’s vibrant and lively performance even in the midst of weaker material, but since just before “Out of Time” the use of her character has been on a downward slope. The love triangle stuff is inevitable, and admittedly having Eddie in the know is enough of a shake-up to make things interesting. Rick Cosnett automatically gets loads of new (and constantly flustered) facets to play, further presenting him as the quintessential down-to-Earth nice guy in the show. But now Iris herself doesn’t come off very well; it makes sense, at first, that she’d be uneasy at Eddie when he’s acting suspicious. But then, even as she claims to believe Barry, that Eddie’s struggle stems from his darker policework and keeping her “not in the dark, but in the light,” she still totally pins Eddie down for answers. The guy’s a cop, meaning he’s going to deal with a lot of confidential cases and material. So Iris is pretty clearly in the wrong by saying Eddie has to be 100% trustworthy when, from what she knows, his “secret” could literally be a case of confidentiality that could get him fired. It screams forced melodrama, and paints Iris in a much more hostile light than she was at the beginning of the series. 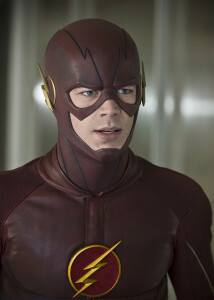 Where the episode flourishes is Barry’s struggle with trust after his Reverse-Flash revelation. 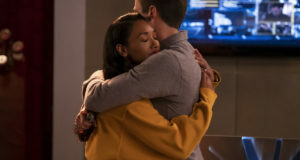 Grant Gustin nails the deep wound Wells’s betrayal leaves, in the aforementioned Felicity scene and underlying virtually the entire episode. Questioning Caitlin and Cisco makes sense considering how close Barry and Wells had become, though it’s good that this thread wasn’t stretched out more than this episode. The other side of the Wells mystery is Cisco’s ability to peer into the alternate timeline somehow, a perplexing but intriguing development. 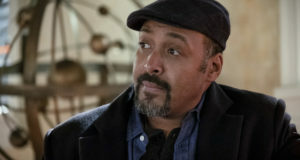 There will likely be a technobabbly explanation for how Cisco’s death mixed with the vibration of Wells’s hand in his body allowed his memory to cross timelines (or something equally ridiculous), but it’s a cozy way to keep the best scene from the “Out of Time” timeline in some sort of continuity. It does seem to be a cop-out on the surface, but considering Cisco was on the trail for Wells since before “Out of Time” on his own anyway, it’s reasonable that he could come to this conclusion regardless of time-hopping memory. This just lets a previously overwritten dramatic moment have some extra relevance. This dramatic ending’s springboard into the Wells mystery, which is sure to take up the rest of the season, puts “All-Star Team Up” in perspective — but not in a good way. This is a fun episode, as The Flash episodes always are, and these guests are always welcome on the show. But they clearly need to fit in to the story being told, because the faulty logistics and lack of real substance in the guest heroes’ stories cause the episode to flounder below this show’s high bar. We’re stalling until we can get to the meat of the Wells stuff, and that’s disappointing considering how fast-paced The Flash normally is. I saw the Arrow episode “Broken Arrow” after this, and that actually turned out to be a better team-up episode, despite The Flash citing one in the title. Mostly in that Oliver Queen and the Atom actually appear to be teaming up. The eighteenth episode of The Flash and the eighteenth episode of Smallville both featured a female bee-themed villain. Weird, right? Love the opening sequence, with the Joe/robber switcheroo. The Joe/Eddie/Flash dynamic is very entertaining before the melodrama heats up. So there’s a defibrillator in The Flash’s suit. For something that’s relatively tight-fitting, there sure is a whole lot of complex tech packed in there. I love food and everything, but that quail egg dish did not look terribly appetizing. Luckily there were going to be 17 other courses…apparently. Liked Felicity listing all the bad stuff going on in Arrow, though oddly enough, it didn’t really sound as humorously bad as those “condensed plot synopses” gags usually are. Then again, stuff just got a whole lot worse on Arrow after this episode. Absolutely love Cisco going after the bee with a freakin’ freeze ray. More shrinking references for Ray! Please, please, please let this go somewhere good. “…Are you…married to that…?” – Cisco and Ray have an adorable bromance. “It’s my boyfriend!” – Oh, show. You’re adorable. Actually, it was The Atom’s glove that Cisco used to fire the electro-blast hole in the console facing.